This online-only article is a supplement to the March/April 2016 print edition of Home Energy Magazine. On a mission to help people make homes more energy efficient? So are we. 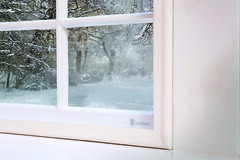 Indow sells and installs interior window inserts in homes that help homeowners stay warmer in the winter and cooler in summer without the expense of complete window replacements. But along with our dealers, we’ve learned that it doesn’t pay to focus on that initially. Energy efficiency isn’t an emotional appeal, but a rational, kind of wonky one. It’s like trying to capture someone’s imagination with a term paper instead of a love letter. Indow works closely with home performance companies as part of its dealer network. A common challenge we’ve shared is how best to introduce energy performance products and services to customers who are looking for something basic: comfort. Making someone comfortable means taking care of them—and that has emotional resonance. Sure, people care about energy efficiency. But their immediate need is no longer to feel chilly in their living room or drafty kitchen or icebox of an office. As they make their home snug, they start to understand that it’s now more energy efficient. Consequently, they often see themselves a little differently: They’re the kind of people who make energy-efficient changes. And some go further: They're the kind of people who take steps to address climate change. But all that comes later—it’s not the message that grabs most homeowners’ attention first. When a customer has comfort problems, offering them window upgrades may lead them to pay for other energy efficiency measures. It’s best to start out talking to customers about comfort rather than energy efficiency or energy savings. Often customers are drawn into understanding home performance not by the concept of energy efficiency or even energy savings, but because their drafty windows make them uncomfortable. Maybe their homes desperately need air sealing and insulating first, but they can feel and see the cold drafts coming through those windows. The data back this up: For every search for "home performance" on Google Adwords, there are 126 searches for "replacement windows." People think about fixing drafty windows before they think about home performance. Bill McKnight, with Energy Conservation Specialists in New York, is a home performance contractor who understands this. He deals a lot with homes, some of them dating back to the 18th century. Drafty windows are a common problem in his area, where historic preservation codes keen on preserving beautiful historic wood windows make it difficult and expensive for people to replace them. Having an interior storm window like an Indow insert in his toolbox has helped him get leads with many customers who have subsequently had more home performance work done. Making someone more comfortable with window inserts generates leads. Roughly 25–50% of customers who call McKnight for Indow estimates end up having an energy audit. Conversely, when McKnight gives a customer an energy audit, he leaves a brochure for Indow, and 50% of those customers call back to learn more. Understand that the best customers are interested in long-term relationships and often like to do additional research on home improvements. Good relationships can lead to additional home improvement work as well as referrals. We’ve learned that building good relationships involves (1) listening and (2) providing customers with content that is relevant to them and their situation. Sometimes customers want a home performance guru to tell them exactly what to do. But we’ve learned that more often than not, people also like to do research. This is a boon! By listening to customers and understanding what they need or want to learn, we can better tailor our content when we reach out. For instance, because we have listened to our customers, Indow has developed a range of customer case studies that deal with different home comfort and efficiency problems across the United States. Listening is also a way of meeting someone’s emotional needs, even if the business at hand is home performance. Listening to what someone has to say—in his or her own home—is an opportunity to connect and begin a relationship. Because many customers like to research how to improve their home’s performance, they appreciate receiving content that is relevant to that research. Data from our Window Hero webinar, which features historic preservationists, support this. When we offered a free digital educational packet to those who signed up, we increased signups by 62%. Michael Ruehle, with Greenheart Buildings, Incorporated in Illinois, has one customer who will do two days of research any time Ruehle mentions a new product. “Some people are like that and want to dive deep,” Ruehle says. Through our direct work with customers and in working with dealers, we‘ve learned that it’s harder to engage people initially if we focus exclusively on our passion to make the built environment more energy efficient. It was a hard lesson to learn, because that’s what fired up our CEO to invent Indow inserts in the first place. So we connect with people on their very real need for comfort and build the relationship from there. We talk about energy efficiency in the content on our web site, in social media, and sometimes in our monthly newsletters—places where people can engage with the topic on their own. Engage with customers first over a specific product that addresses comfort, not over an energy audit. Many of our dealers have reported that customers seem more interested in making home performance changes when they start the process with a specific product that addresses comfort. An energy audit provides homeowners with a laundry list of possible actions, and it can be hard to know where to start, since the energy auditor’s subjectivity comes into play, says Michael Ruehle, who does energy audits. It’s like picking a city to live in based on a Ten Best Cities article. The best city might not be the best one for you. “If you start with a solution that makes your home more comfortable, the end result also leads to energy savings,” Ruehle says, but it’s easier for customers to understand how you got there. Ruehle has stopped emphasizing energy audits for that reason. Audits can be hard for customers to digest, but when customers call over drafty windows, he knows they’re committed to making changes. “There’s an immediate reaction—which is different than when you do attic insulation—the windows aren’t cold anymore and you don’t get cold.” And that gives Ruehle an opportunity to talk to people about other things they might do to save energy and make their home more comfortable. Carrie Sturrock is the company storyteller at Indow. Discuss this article in the Best Practices (Residential), Marketing Energy Efficiency and Social Media and Energy Efficiency groups on Home Energy Pros!